Follows NYPD Officer Steven Mayfield as he goes about his beat, from dealing with friendly and hostile people to coping with major dramas and the monotony of daily paperwork. Simultaneous. Arlene Schulman, acclaimed author and journalist, lives near Officer Mayfield’s beat, in New York City. Arriving at a time when police officers are enjoying a new respect from citizens for their everyday heroism (especially in New York City), a day-in-the-life-type biography of a cop seems particularly appropriate. However, Schulman's (The 23rd Precinct: The Job) portrait of 40-year-old Mayfield, a respectful, dedicated officer often angered by the politics, corruption and danger in his line of work, will not likely inspire many readers to become civil servants. The author follows Mayfield on his beat in upper Manhattan, where he has witnessed his share of domestic disputes, gang violence and drug deals. "Being a beat cop means being nearby when you're needed," Shulman writes. Her journalistic approach involves having passersby comment on Mayfield's contributions to the neighborhood, as well as quoting his mother about his childhood ("[He was] always good"). 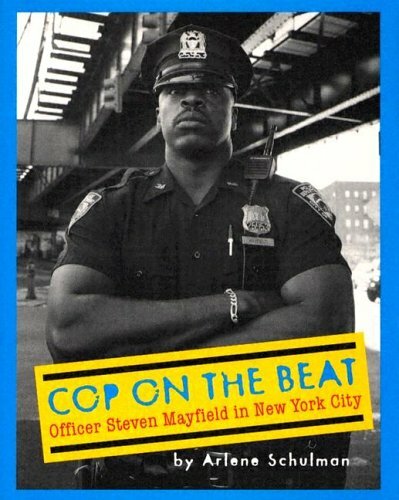 The volume then jumps to a brief history of the New York City police force and also offers a look at how Mayfield spends his time off, including introducing readers to his best friend. Throughout, Mayfield provides candid comments about the people and situations he faces on the job. Unfortunately, the somewhat stilted narrative rarely brings any drama to inherently dramatic events. A postscript about Mayfield's best friend, who was killed in the World Trade Center on September 11, 2001, for example, seems tacked on. Photos not seen by PW. Ages 14-up.